When we talk about advertising, we are talking about making people want to buy. 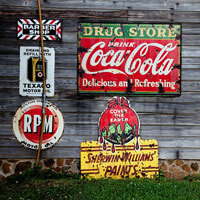 The principles of advertising have not changed over the decades. The ads you see on the wall in the picture above made millions for the companies that originally ran them. Today, we see ads on more than just building walls. Thanks to the information age, we now have virtual walls in the form of the YouTube channel, the Facebook wall, the Pinterest carousel, and the LinkedIn news feed. However, if we think about it, there is little difference in posting a meme or a video on a Facebook wall as there is in hanging one of these classic ads on the side of a building. While the physical media have changed, the messaging has not. Of course, as various types of media have become more sophisticated and pervasive, the average attention span has decreased. In today’s marketplace, with so many messages vying for our attention, you must capture the viewer’s attention span and immediately communicate your value before he or she moves on to something else. The ads that we develop work to do exactly that. They work just like magazine and newspaper ads did in the past, but they work more quickly and across a broader network of social platforms and internet devices. The most powerful of these devices is the mobile phone, which gives us the ability to position your brand right in the palm of a customer’s hand where it is sure to be noticed. With all the changes in communication, a simple ad or short video still remains the most effective way to capture a customer’s attention. Small-town America needs this now more than ever before. Preserving the look and feel of tradition and history–while using the most sophisticated modern tool–gives you a competitive advantage over the major corporations that threaten small local businesses. This is best accomplished by anchoring your ad campaign in your news blog. Think of your blog as a personal, digital magazine that organizes and publishes everything you need for brand positioning, lead generation, and repeat business. Eye-catching visuals and memorable copy capture the attention of customers and bring them to your website. These visuals can take many forms, ranging from high-resolution photographs, illustrations, and infographics to slide shows and commercial-quality videos. Our graphic designers use web-friendly colors that make your brand stand out in Google and Bing image listings. Our writers develop compelling copy that capture the minds of online searchers and social media followers and bring inbound leads to your sales team. Approaching digital advertising with a campaign strategy is the best way to ensure a long-term result for your brand. Ads are tagged with the proper metadata that will allow them to be indexed by search engines and positioned in the rankings where customers who are looking for your type of product or service are most likely to see your brand. Slant Zero makes ad creation easy and affordable. 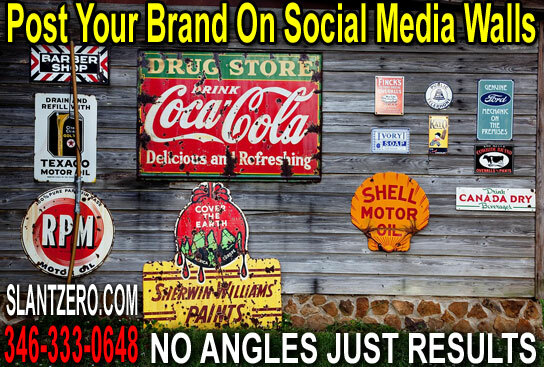 Call us now to begin your next ad campaign.